Board to Death has posted up another in their video review series. 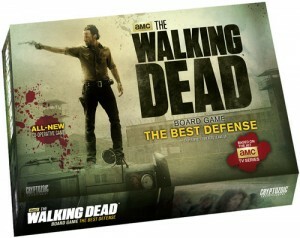 This time it's The Walking Dead: The Best Defense. The Walking Dead Board Game: The Best Defense is a cooperative board game in which players take on the roles of Rick, Glenn, Daryl, Michonne, and other characters. The Survivors must defend four key locations from Walkers – the Farm, the Prison, the Town and the Highway – in order to stay alive. The game board is assembled at random for each game, providing for variability in the locations; a 25-card resource deck – containing either Equipment, Allies, Food or Ammunition – is placed at random on one of the locations.